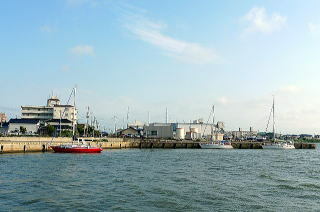 At the end of long Sakata Port breakwater, there is a red lighthouse. It can be seen easily from the distance. But, please be noted that, the breakwater extends further 100 meters beyond the red lighthouse. There is a small red mark located at the exact end of the breakwater though, it can not be seen from the distance. Moving around the red lighthouse, you move into along the long breakwater. Few ships are coming and going. Passing by three red buoys, No.2, No.4 and No.6in order on your right, move into the port. Before the innermost of the bay, there is the mouth of the river on your left or in the east. Three berths are on the south bank quay of the river mouth. (A) berth is at the corner of the old quay. (B) berth is at the bending old quay in the east of and in the upstream of (A) berth. I moored at (B) berth because it is calmer than (A). After my mooring, two yachts from Hokkaido moored alongside at (A) berth. A fishing boat was moored alongside at (C) berth which is in the upstream of (B). There are many restaurants around. A public bathhouse “Spa Garden” is 5 minutes walk away. Fuel is available in front of “Spa Garden”. Toilet is inside Citizen Health Center building, which is 4 minutes walk away and opens 8am. I asked Gyokyo, Fisheries Cooperative Association, for water. They were kind. Provisions: A big supermarket “Yamagiwa” is 10 minutes walk away at a street in front of Nokyo, Agricultural Cooperative. Another good shop is at Sankyo Warehouse(*). It has fresh vegetables and fruits, and Sake, with reasonable prices. 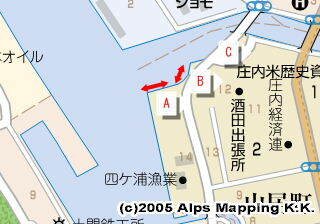 (*) Sankyo Warehouse is a historical rice storage, less than 10 minutes walk away from the berth above. A historical house of Honma Family is also in a walking distance. Honma Family was the largest landlord until World War II and had businesses of finance and shipping. As the family supported local domains financially, an old song sang “While I can never be a family member of Honma, if I could, I want to be a local domain lord at least”.